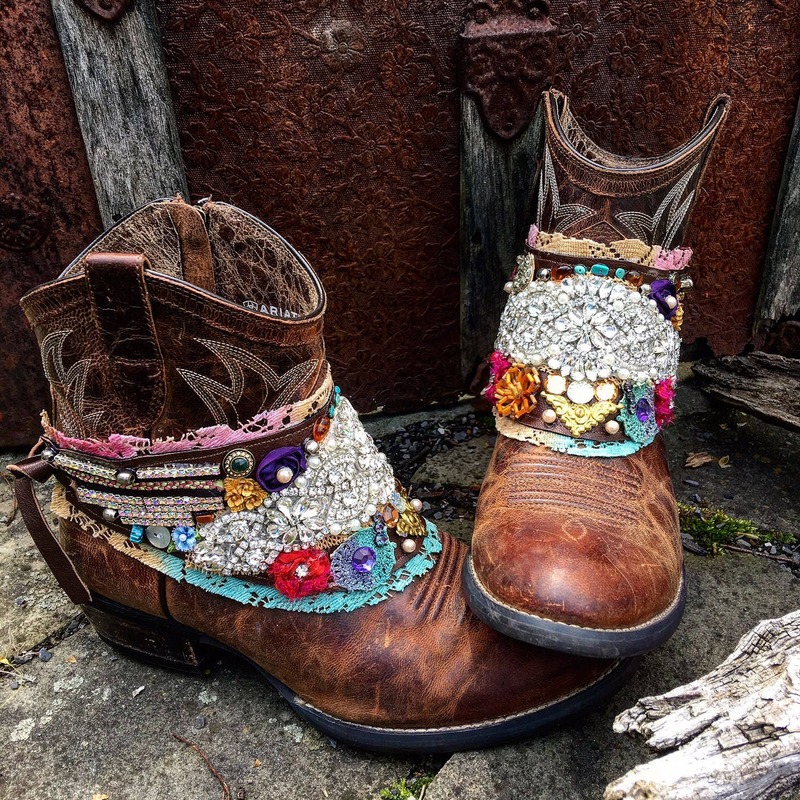 This listing is for one pair of handmade sparkling boot wraps (please note - the leather cowboy boots are not included). The leather boots are used for displaying the boot wraps. If you're interested in purchasing the boots along with the boot wraps, please contact us. 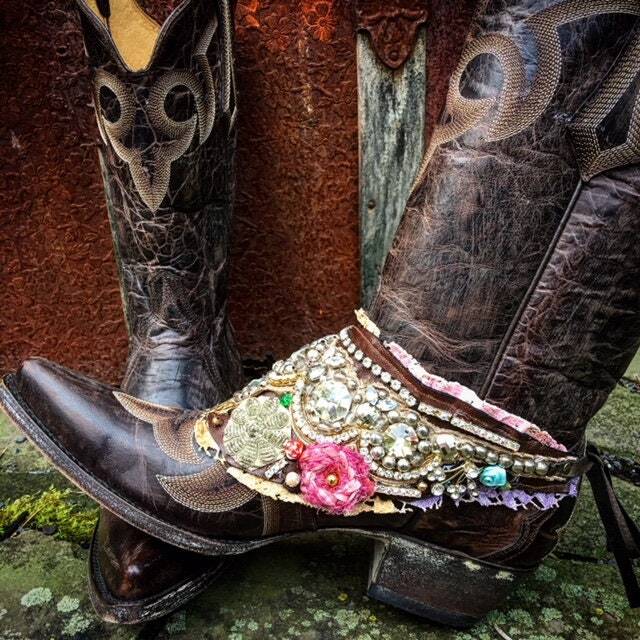 Allow us to decorate your favorite boots with a pair of our sparkling Bohemian boot wraps! You will receive 2 boot wraps - one for each boot. 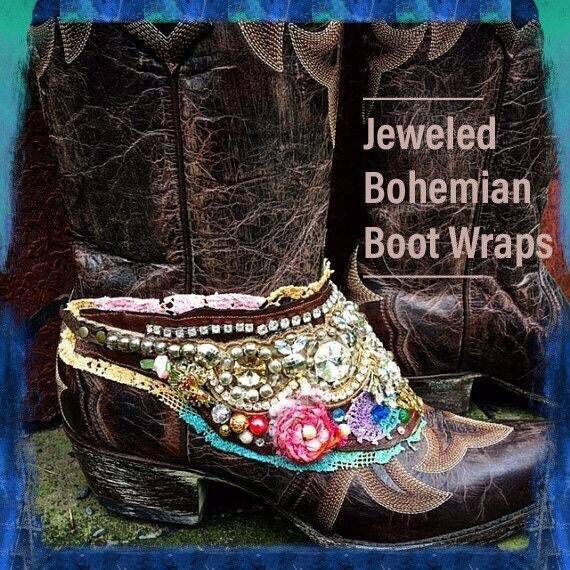 Sparkling Bohemian Boot Necklace Wraps, Bohemian Treasure, Wearable Art, Hand-Painted, Tea-Stained Antique Lace, Silk Ribbonwork, Rhinestone Jewels, Fabric Art, Swarovski Crystals, Beadwork, Twinkling, Magical, Fairy Tale, Romantic...One of a kind. 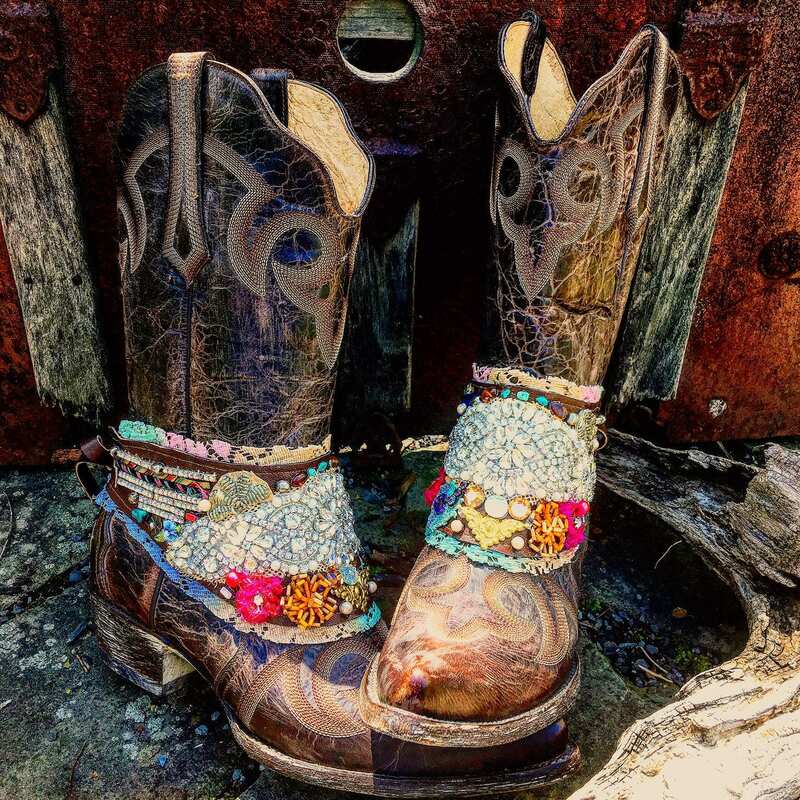 You will be commissioning us to create for you a custom pair (2 boot wraps - 1 for each boot) of sparkling Bohemian boot wraps for your favorite boots (short or tall). Choose from the following decorations to add: leather, tapestry, vintage fabric, lace, faux fur, vintage fur, leather fringe, jewelry, tassels, feathers, charms, crystals, beads, appliques, gold bullion, metal hardware...and many other decorations. * Please note - boots in photos are for display only. Boots are not included in price - only boot wraps. The pictures above are only examples of our creations. Each pair is unique and one of a kind due to rare and vintage materials used to make them. Your boot wraps will also be unique. They will not look exactly the same as the photos above, but will have a similar style and colors. All jewels and embellishments are glued onto genuine leather with strong adhesive, not hand-sewn on. 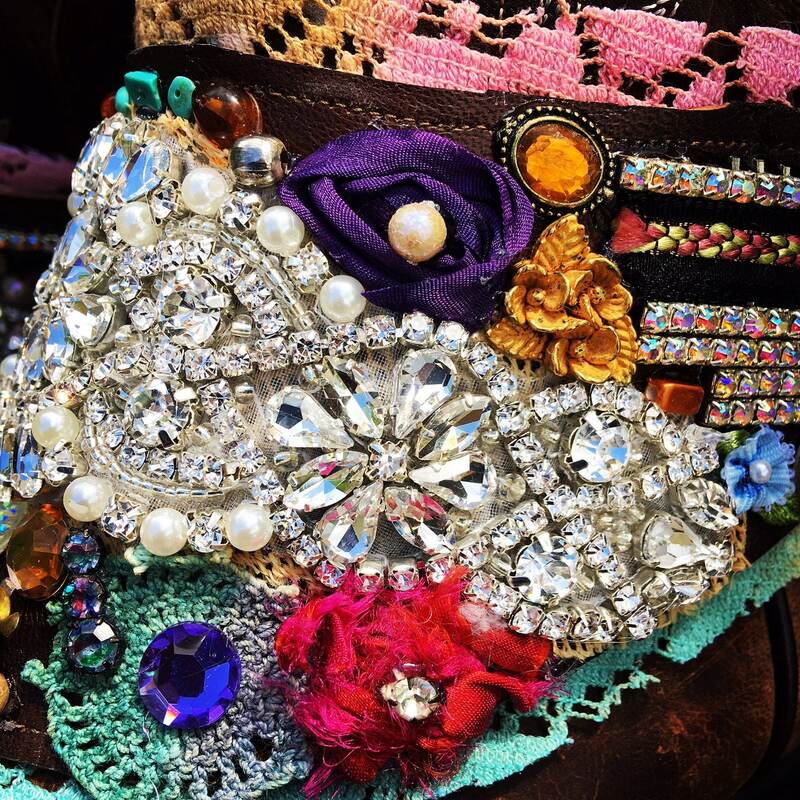 Antique lace backing is sewn to leather, and hand-dyed in an array of beautiful colors of the rainbow. 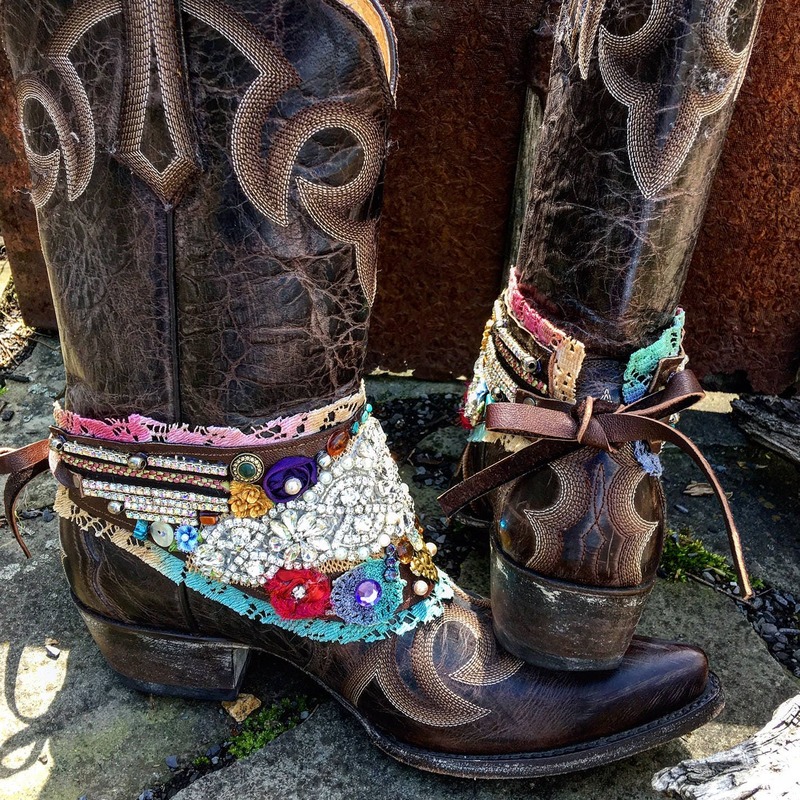 Truly one of a kind boot wraps! Your custom boot wraps will tie in the back with strong leather laces attached to the main piece with rivets. Main piece measures approx. 12" long x 4" high (measurements may vary according to your specifications), leather laces measure approx. 9" long each. Will fit over any boot due to being adjustable. Please provide us with your favorite colors and your ideas, or the look you'd like to achieve in the 'notes to seller' box at checkout. You may also send us a message through Etsy. If no instructions are provided, We'll assume you'd like a pair of boot wraps similar to the pictures in this listing. Processing time, depending upon other orders and availability of materials and accessories, is 1 - 2 weeks. During the creation process and upon completion, We'll send you photos for your approval, then ship your decorated boot wraps to you. It's very important that you check your messages on Etsy, since this is how we'll communicate regarding your boot wraps. Any shipping overages will be refunded to you promptly. 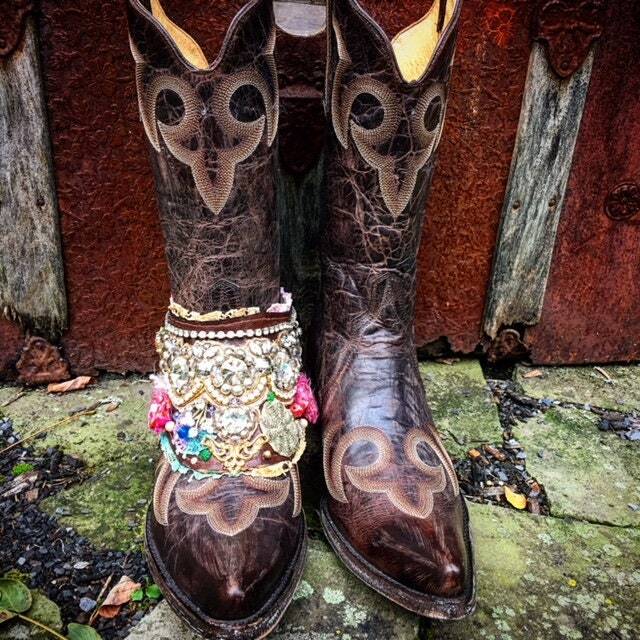 We can also dress up your favorite short or taller boots! Please check out the listings in our shop for custom outfits for boots, and reworked festival boots that are ready to ship! Insured Priority Mail shipping with tracking within US.